A look at the timeline of skiing provides a fascinating journey into the history of a dynamic sport. In ancient times, skiing was a form of transportation. Then, throughout the centuries, more sophisticated means of transport were developed. The question then remains to be asked- if other types of transportation were readily available, why wasn't skiing abandoned? Obviously, many people found it to be an exhilarating and enjoyable recreational activity. Here are some highlights of the timeline of skiing in the ancient world. 6300 BC: The world's oldest skis were discovered in Russia, near Lake Sindor. 4000 BC: Rock carvings of a skier from this period were discovered in Norway. 3300 BC: Skis from this time period were discovered in Finland. They were 180 centimeters long and 15 centimeters wide. These skis had five grooves. 2700 BC: Two skis and a pole were dug out of a bog in Sweden. 2500 BC: Archaeologists discovered rock drawings that depict a man on skis holding a stick. The drawings were discovered on a Norwegian island. 200 BC to 200 AD: First documented reference to skiing in China. In looking at this ancient timeline of skiing, we see that it was an activity that was practiced predominantly by the people of Sweden, Norway and Russia. In this period of the timeline of skiing, we see how skiing was used for military efforts. 552 AD: The Greek translation of the Gothic Wars refers to the Scrithiphini, which means "Finns who glided". 1199 AD: Historians speak of the Battle of Finnmarkers and Danes. The battle was fought on skis. 1700 to 1721: This was the year of the Great Northern War. Russians used ski troops when battling the Karelian Isthmus. 1733: The first rules for skiing military were written by Jens Henrik Eahusen. In the 1800s, we begin to see the development of ski racing and recreational skiing. 1850: Sondre Norheim, of Morgedal, Telemark, discovers the heel strap. He entwined shoots of birch tree roots with enough stiffness to provide adequate control, but enough elasticity to keep the heel in a snug position during both downhill skiing and ski racing. 1866: A competition was conducted by the Central Ski Association. It took place in the Norwegian capital Christiania. Sondre Norheim and his Telemarking team demonstrate what will later be called a telemark turn and a Christianna skidded stop turn. 1870: Sondre Norheim introduces the first modern sidecut ski. This narrow waisted ski flexed easily on the snow, which facilitated smooth carving and turning. 1879: Norwegian immigrant Martin Strand opens the first North American ski manufacturing plant in Minnesota. 1882: Norwegian immigrants organize the Norske Ski Club in Berlin, New Hampshire. 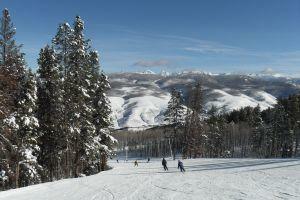 It is the first ski club in America. In the 20th Century, skiing began to become popular in the United States. While the Europeans developed new ski techniques, Americans began to create ski clubs. Ski racing was enjoyed in different parts of the country. 1910: The first ski congress is held in Christianna, Norway. This would eventually become the forerunner of the Federation Internationale de Ski, otherwise known as FIS. The FIS is the ruling body of international ski racing. 1910: Johannes Schneider, a St. Anton ski guide, creates the stem christie with a movement that turns the skis parallel at the end of the turn. Some ski instructors still teach this movement. 1929: First ski train runs from Boston to Warner, New Hampshire. 1932: North America's first rope tow is installed at Shawbridge, Quebec. 1934: The first American rope tow is installed at Woodstock, Vermont. 1936: The first issue of Ski Magazine is published in Seattle. 1936: Sun Valley opens in Idaho as a Union Pacific project. It featured the world's first chairlifts, which were designed by Union Pacific Engineer Jim Curran, who copied from the banana lifts used in Central America to load United Fruit cargo vessels. 1938: First certification examination of ski instructors is held at Woodstock, Vermont. 1938: First US Ski Patrol established in the United States. Minot Dole becomes head of the national committee. 1939: Otto Lang presents Ski Flight, the first ski film to be shown in the United States. It played at Radio City Music Hall, on the same bill as Snow White and the Seven Dwarfs. 1942: The 10th Mountain Division arrives in Camp Hale, Colorado. Minot Dole recruited volunteers from the National Ski Patrol. 1945: Friedl Pfeifer outlines a plan for creating a world class resort at Aspen. 1949: Howard Head creates the aluminum Head Standard, which was the first commercially successful aluminum ski. 1963: First resort organization, the National Ski Areas Association, is formed. Obviously, this has been a mere glance at the timeline of skiing. For a more detailed look at skiing history, visit the FIS Ski history page and the skiing history website.